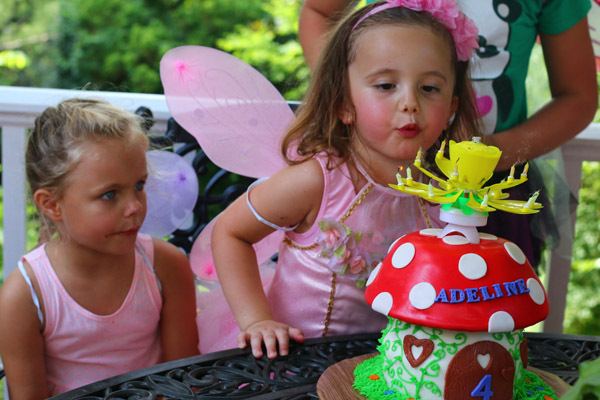 Many months ago, Adeline decided that she wanted to have a fairy party to celebrate her 4th birthday. Her party was a few weeks ago and it was truly magical. 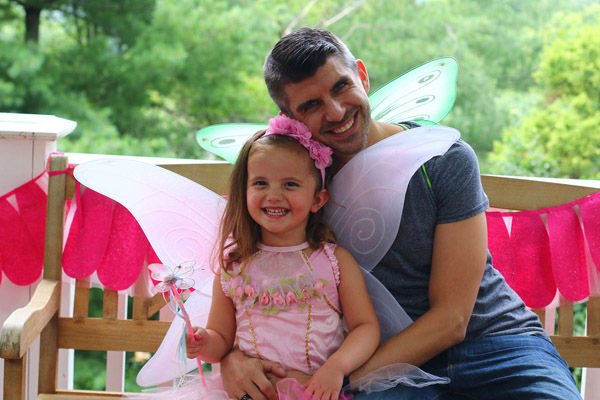 I’m really excited to share her fairy party with you over the next few days. Today I am going to share the whole party, then tomorrow I will share in-depth about the treasure hunt, and Friday I will share the craft. A special shout out to my friend Chris flew to town to visit our family and help with the decorations. I couldn’t have done it without him. 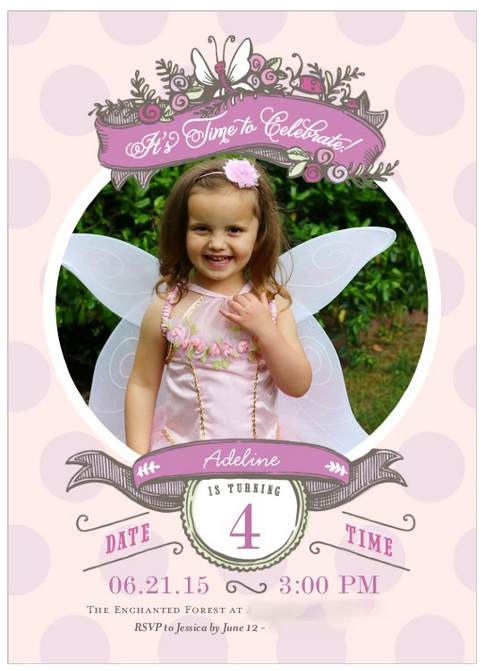 I had a coupon for Shutterfly, so decided to make Adeline’s invitation on there. 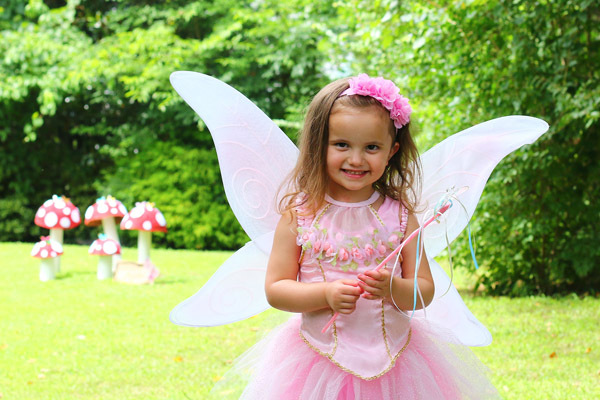 This dreamy design paired with a photo of Adeline in her fairy costume from Chasing Fireflies was simply perfect. I wanted to keep the decor from being too commercial. I decided on a purple and pink color palette and accented with wood, flowers and natural elements as much as possible. 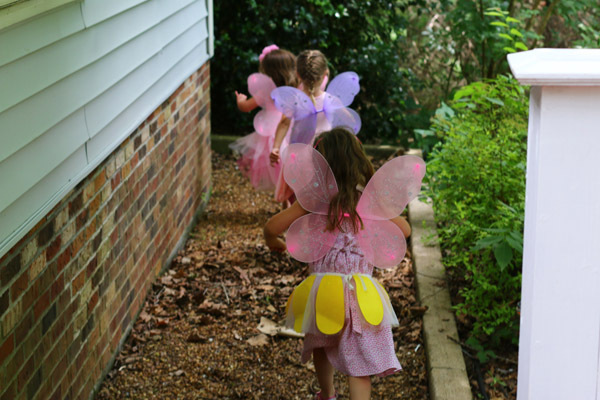 I discovered the flower fairies line on Chasing Fireflies’ website and was delighted when they offered to send it to me to use for the party. The collection features old fashioned flower fairies and fit perfectly with the theme and sensibility I wanted to create. For the signs, I used cardboard and glued sticks to the edges. 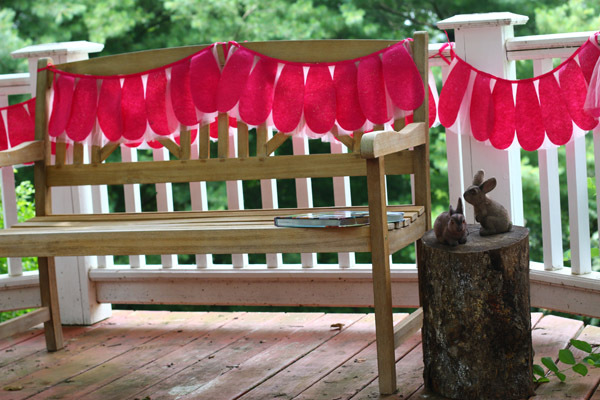 I then adhered fairies (from this garland). Very affordable (can’t beat cardboard!) and woodland-like. I also bought two dozen Easter baskets 90% off (60 cents a piece) that had flower petal fairy skirts attached to them. 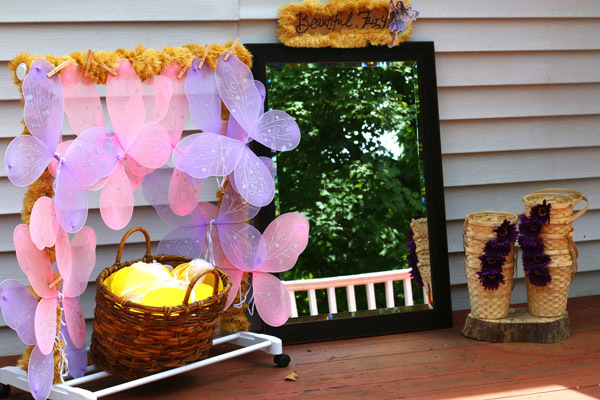 I used some for the girls fairy skirts (like the yellow one pictured above) and some for garlands on the deck and in the front of the house. Next to the bench we had a stump with some fake bunnies on it, to add to the woodland feel. The bunnies are as old as me. My grandma puts them out every Easter and I was so thrilled to incorporate them into the decor. No one probably noticed them, but it’s the little things, isn’t it? The party was from 3-5, so we just did snacks and cake. I made fairy “wands” using pretzel sticks dipped in chocolate and sprinkled with candy and also had a tray of fresh fruit. I totally forgot to take more pictures of the table, but you know what fruit looks like! 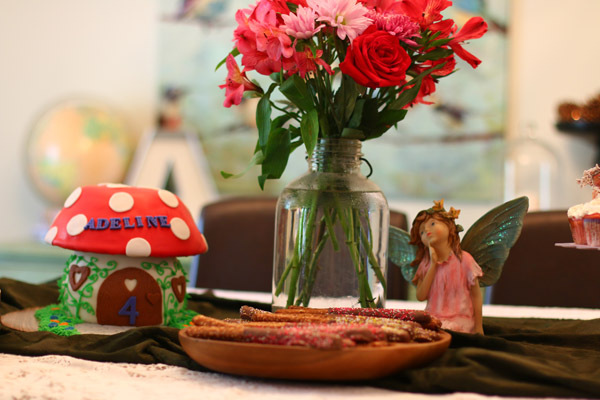 I kept the table very simple, with some fresh flowers and a ceramic fairy I bought at Michaels, along with the cake. I used some textured green fabric to look like grass over a lace tablecloth. 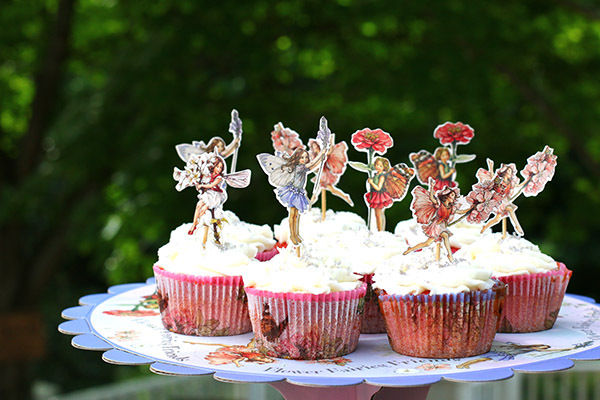 Because I was worried about the size of the cake, I also made strawberry cupcakes with fairies on top. They were so sweet on top of the fairy cake stand. 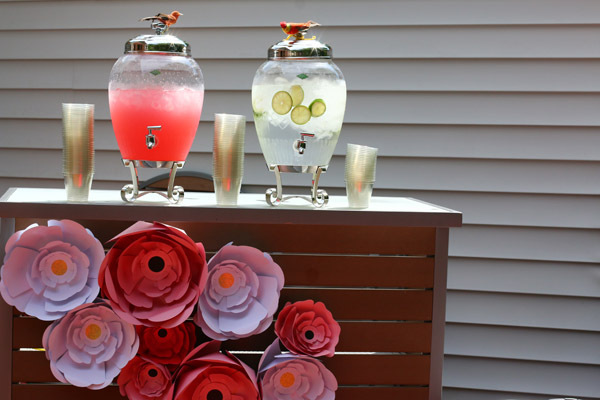 We served pink lemonade and water for the drinks. (I always make a big carafe of juice vs. buying juice boxes. It is more affordable and prettier.) I attached fake birds with wire to the tops of the carafes. 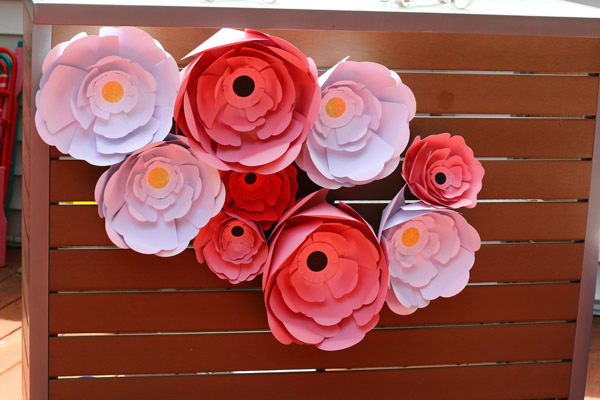 We attached wire to the backs of the giant paper flowers from Michaels so that they could be adhered to the bar. 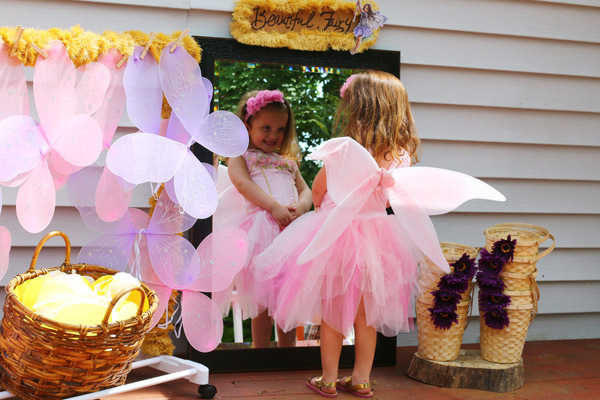 Rather than doing traditional favors, every girl received a pair of fairy wings, a wand and a skirt. The skirts were actually attached to Easter baskets that I bought 90% off at Target this spring (remember my prep post here?). I bought the wings and wands at The Dollar Store around Halloween, thinking I wouldn’t find them again. Turns out, wings and wands are something The Dollar Store always carries. I created a dress-up station that was the first spot the girls went to when they arrived. I took a hanging rack and wrapped it in this old garland that I think my Grandma had in her basement for the past 30 years. It was PERFECT for the woodland effect. I then leaned a big mirror that normally hangs in our living room against the siding. 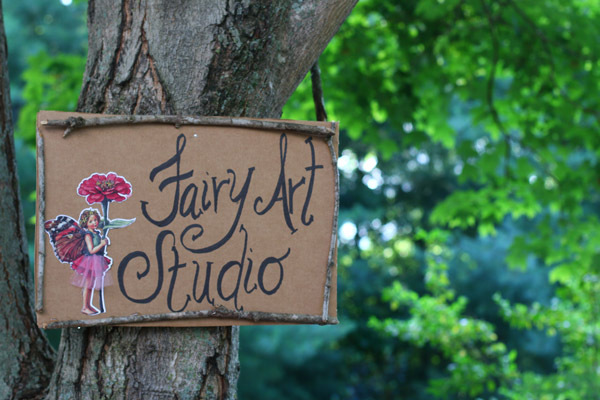 Above it, I made a sign that said Beautiful Fairy. It was so fun to see the girls check themselves out. 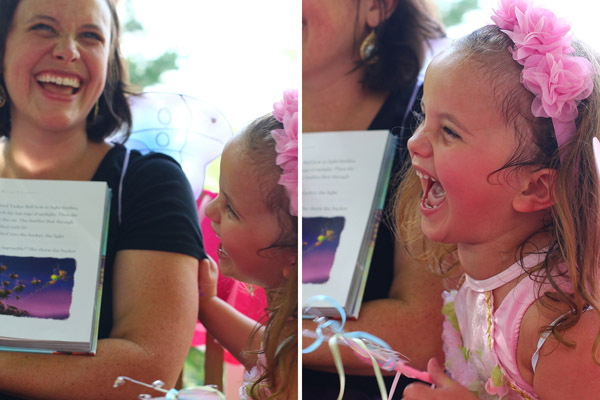 Adeline wore her special fairy costume from Chasing Fireflies, which was simply darling. Because it was so hot outside, she did complain of it being a little itchy, so she wore a pink leotard under it. I was surprised that it was hard to find many fairy games online. 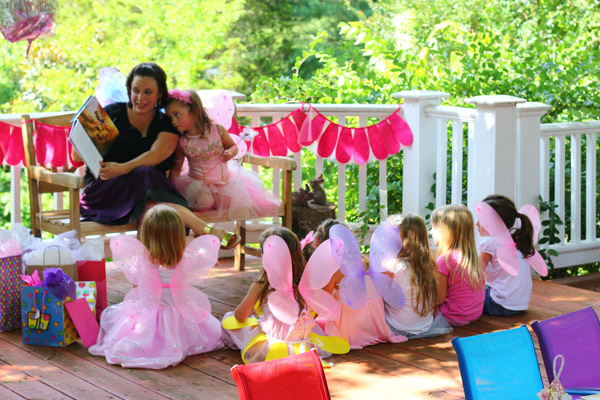 I read through a lot of party recaps to figure out what would make sense for the girls at the fairy party. 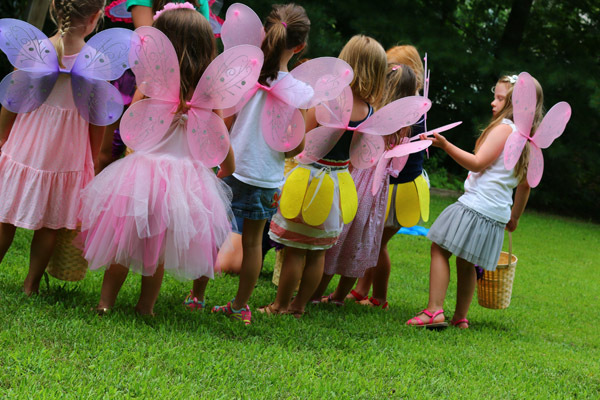 We started the activity portion with a fairy treasure hunt. It was SO cute and the girls loved it. During the hunt I had the girls stop for a group photo. This was a great way to ensure that I got one since they were motivated to listen throughout the treasure hunt. After the treasure hunt, we made fairy houses, which was definitely a highlight of the party. 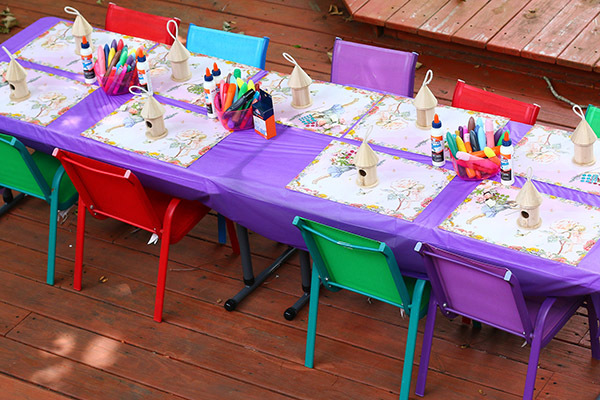 Every girl had a spot with a fairy placemat and art supplies from Elmers. It was also really sweet that the girls could go home with their little houses. Also, I invested in two folding tables with legs that can go multiple heights – from kid size to adult. These were worth every penny and I know I will use them for many parties to come. Then the girls played a few games. 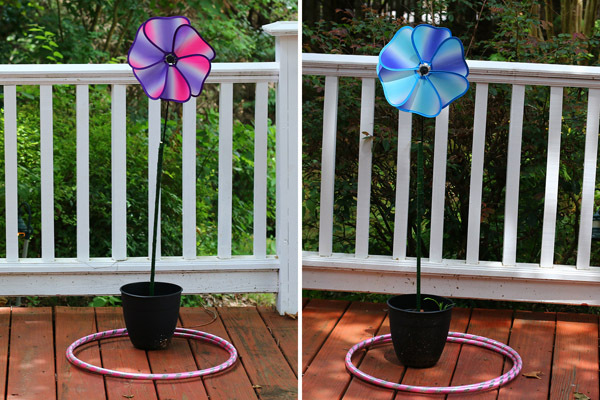 We had a flower ring toss made with dowels and outdoor decorative flowers (from The Dollar Store). 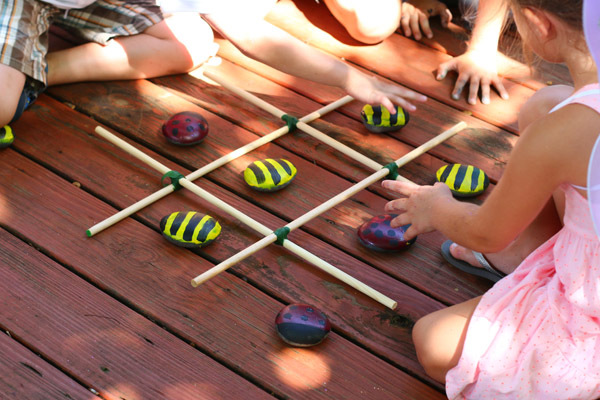 We also made a simple woodland tic-tac-toe using stones painted as ladybugs and bumble bees. 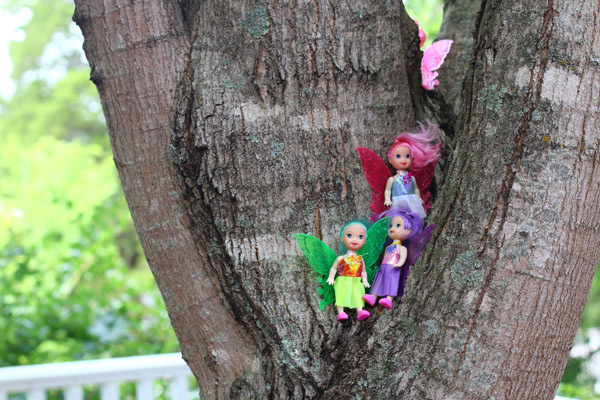 The girls also had to find their own fairy in the trees. It was surprisingly difficult to find affordable little fairy toys. I ended up buying these from The Dollar Store. After the playing was done, we read a fairy story from the Disney Fairies Storybook Collection book . Adeline got to sit next to me as we read and it is a really sweet memory from the party. Also, don’t you love that we have matching sandals? We then opened presents before having some cake. After the crafting and present opening, we did cake. If you are in Nashville, I highly recommend Wendi with Sugar Lump Cakes. This was our second year ordering cakes from her and she does not disappoint. 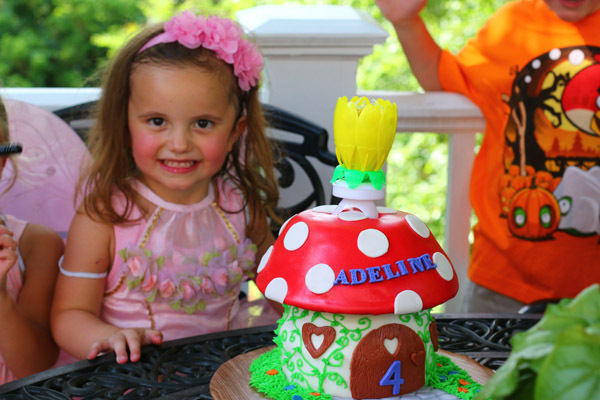 Adeline squealed with delight when she saw her mushroom cake. This was one of my favorite parties I have thrown. 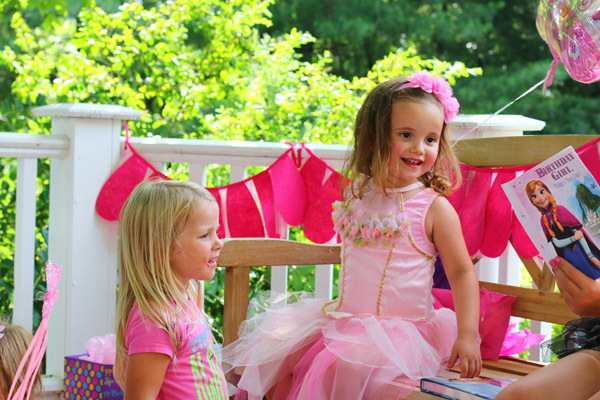 It was a really sweet afternoon that I know Adeline won’t soon forget… I love being a mommy to a girly girl. 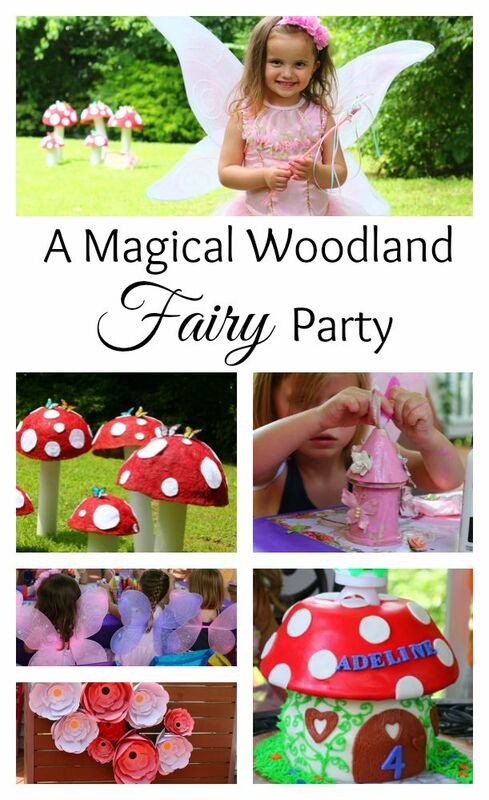 For more fairy party inspiration, check out my fairy party board on Pinterest. Please also pin the image below to your own party/inspiration boards. 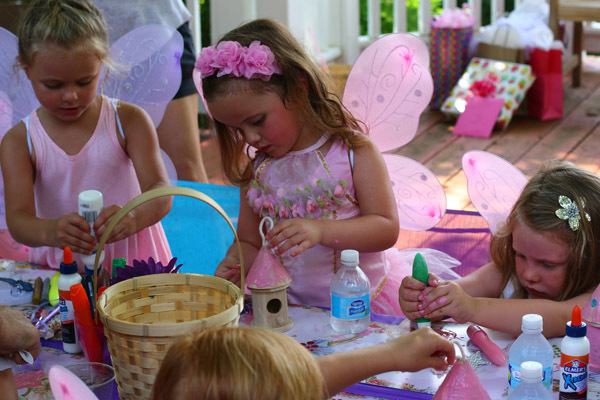 A special thanks to Chasing Fireflies for providing Adeline’s fairy costume and the lovely flower fairy decorations and Elmer’s for providing the paint and glue. This post contains compensated affiliate links. Would love for you to come to a party sometime. You are always invited! 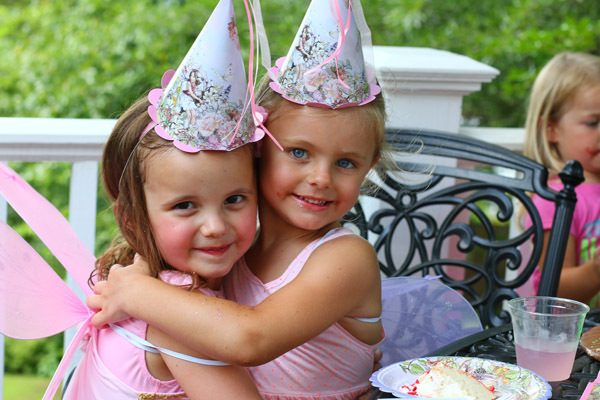 oh my goodness… this is just the sweetest party ever! what precious memories you made. how you carried the theme throughout all those small details… amazing! love, love, love! So precious! Fowarding this on to a friend whose little girl loves fairies. 🙂 Found you through Thursday Think Tank! Love it!! What a cute party. My daughter would love that too. I know I will have to do one to soon, thanks for the great ideas. What a magical, fun party. Everyone looks so happy and they look like they are having a wonderful time. 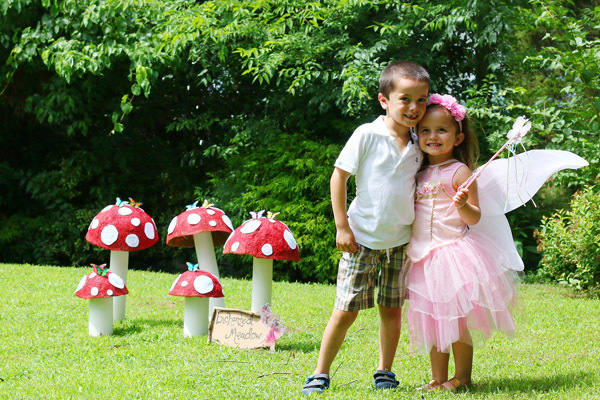 It sounds like you put a lot of planning and “magic” into this special party! Such fun! 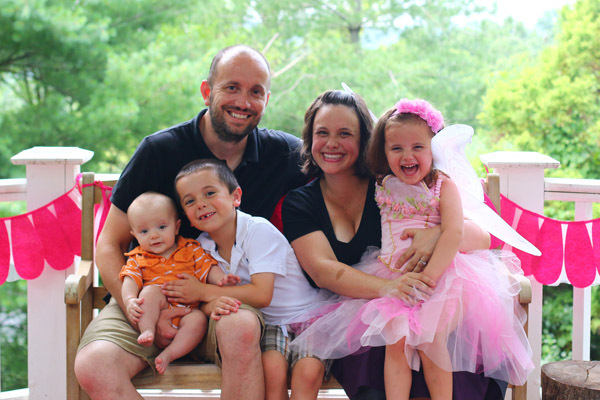 Thanks so much for linking up to Celebrate It! 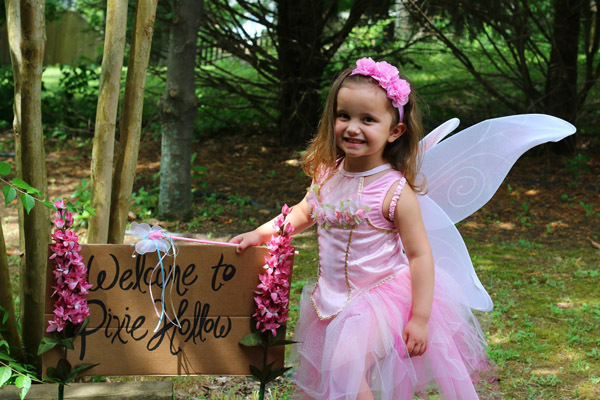 This is just too precious for words – I could just melt over the Welcome to Pixie Hollow sign and you’re daughter looks just like a fairy princess – what a beautiful idea for a birthday party ! 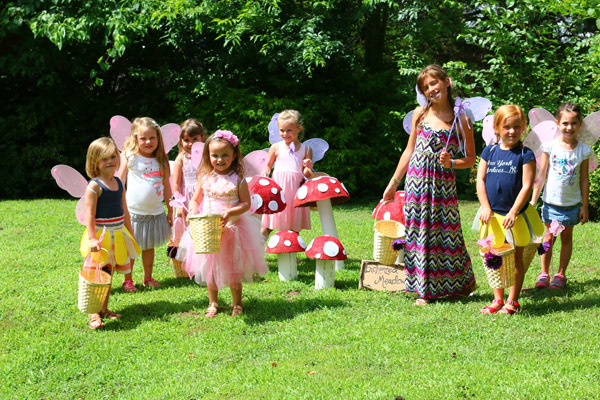 Oh my gosh, this is such an adorable party! 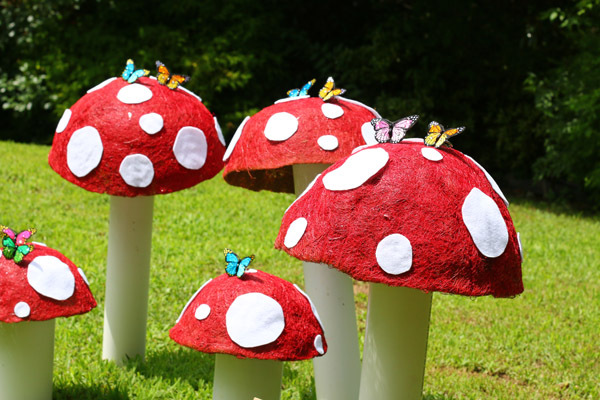 Those mushrooms… I would never have known that was PVC pipe and pots. So cute! What a great idea. Thank you for sharing at Inspire Me Wednesday. Featuring you in this week’s issue (and on Instagram tomorrow). This looked so neat!! 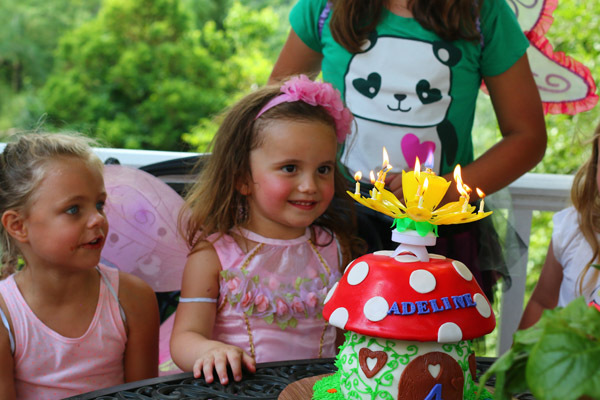 The flower candle on top of the cake was super cool and the girls looked like that all had so much fun. This was a great idea. I love the mushrooms best! How did you get the mushrooms to stay in the ground? Did you put a stake in the middle of the PVC pipe? Hi!! I LOVED your party idea and all the efforts you put in!! I cant seem to find the type of pots you used for the mushroom heads. Do you mind letting us know. I can’t seem to find it in Jo-Ann website. Thanks so much!